Do you just want to chill out for a bit? 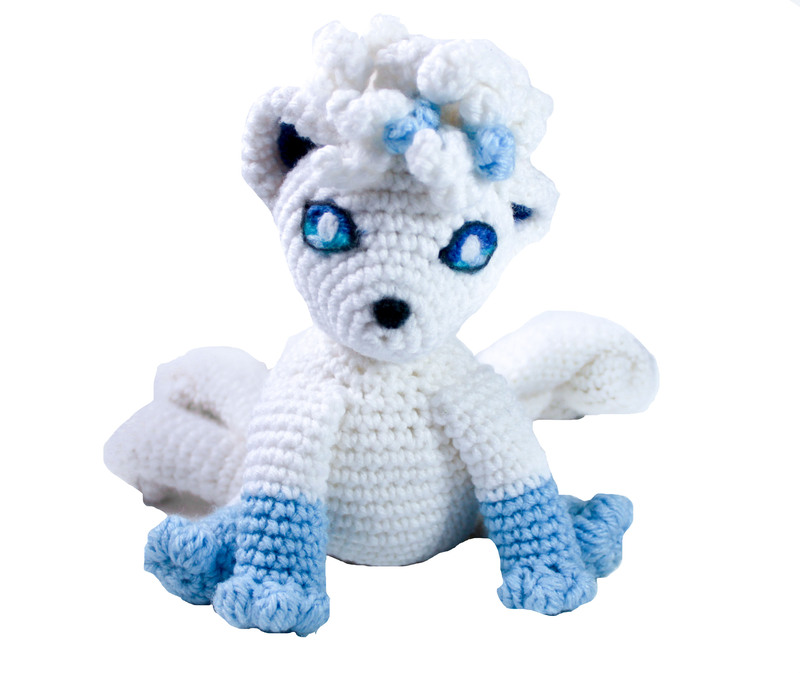 I have the perfect buddy for you: ice-cold Alolan Vulpix just wants to chill out, cuddle, and not do anything to mess up her perfect hur. Additional Skills: Puff stitch, making a Curlicue / Corkscrew / spiral. R21. Sc 2, dec around (18) f/o- leave end open to attach head. R3-R28. Sc around (12) 25 times . 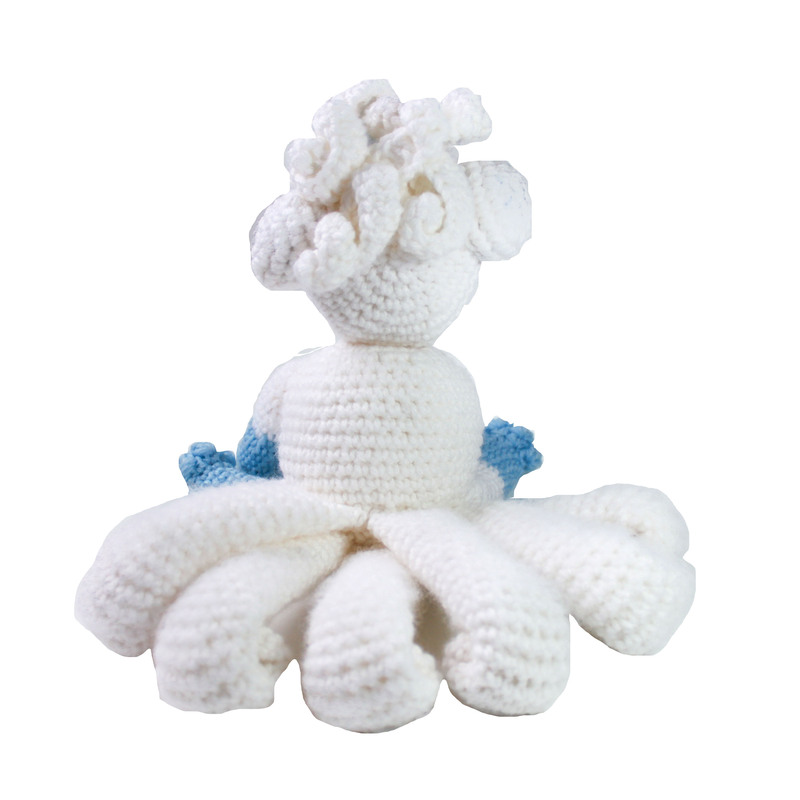 f/o Stuff lightly and roll the closed end of each tail inwards – sewing in place. R3. 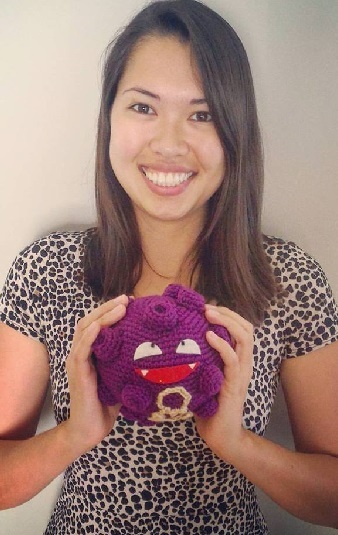 Puff stitch (with 6 on hook before pulling through) and sl to next stitch, repeat a total 3 times after the last puff stitch do a sc into next sc instead of a sl st.
Make 4 with white yarn and 2 with blue yarn. Chain 10, working back along the chain (in second ch from hook) sl st, sc 4, inc, sc in remaining 4. Repeat for other bangs – note: you can add the inc step in random places along the chain to make it more curly if desired. Make 5 pieces using white. Chain 27, working back along the chain (in fourth ch from hook) hdc 4, hdc inc (2 hdc in one sc). Repeat until end of the chain. Note: You can add the inc step in random places along the chain to make it more curly if desired. Attach ears to head and then the hair and bangs- arranging as desired. Attach the legs and arms to the body, and the head to the body. 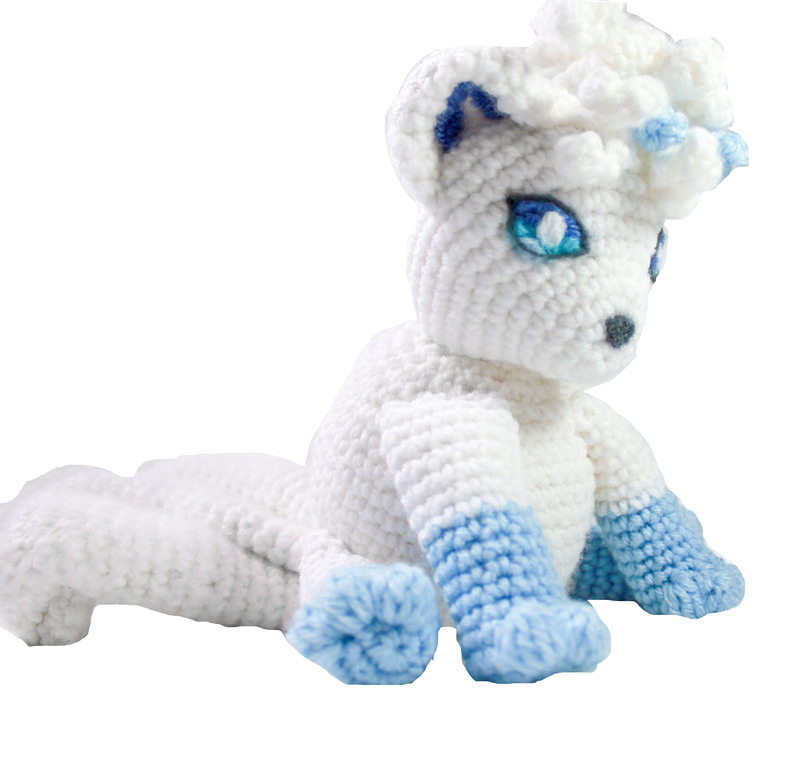 Attach the tails to the body – note if placed too high on the body the tails will add too much weight and cause Vulpix to fall over backwards. 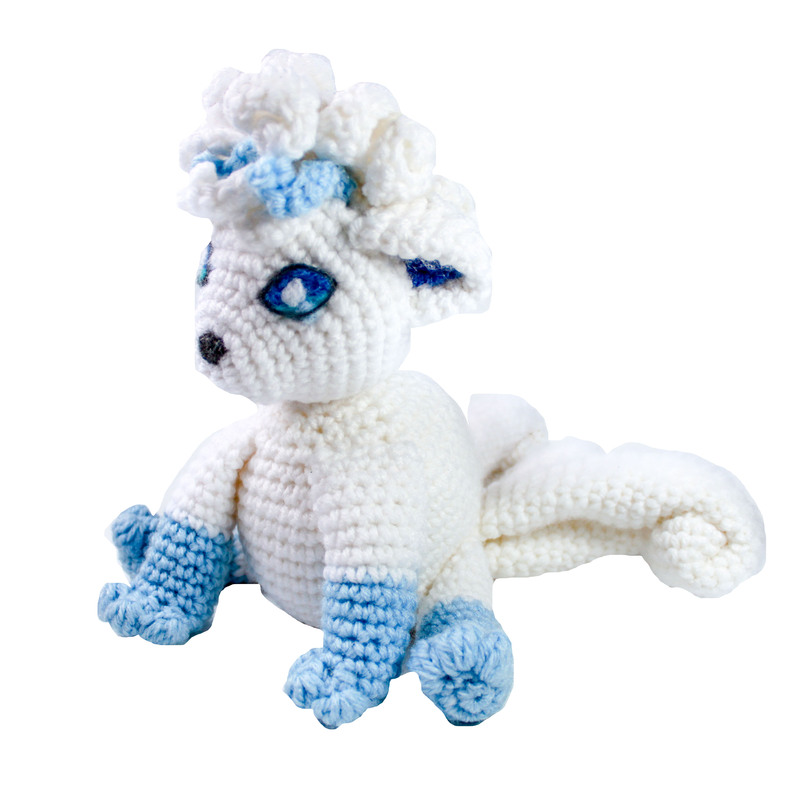 Be sure to arrange the tail near the bottom of the body/ in such a way that Vulpix remains balanced. Brush the tail lightly with a bristle or metal brush to make it more fluffy. Eyes and nose- these features were added by needle felting on leftover yarn ends directly onto the face. Alternatively one could use colored felt pieces. 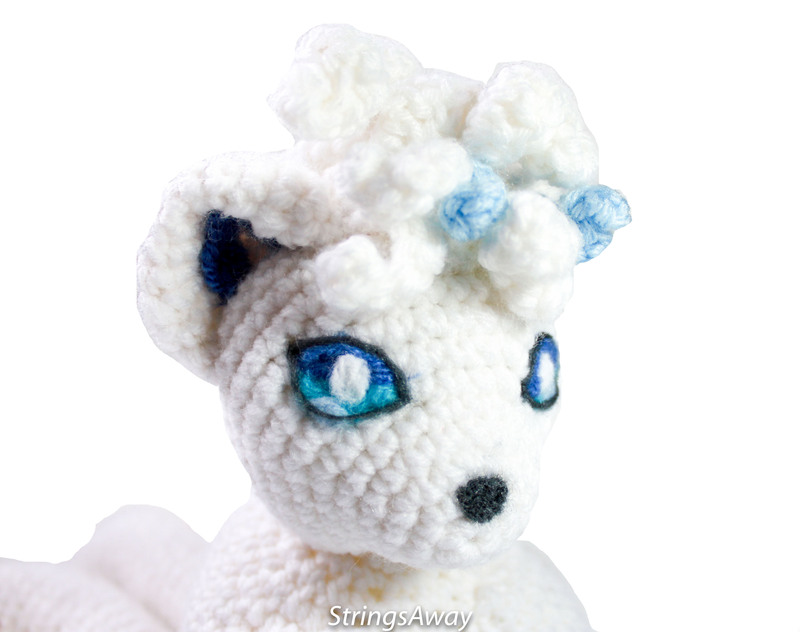 I hope you enjoy your Alolan Vulpix! 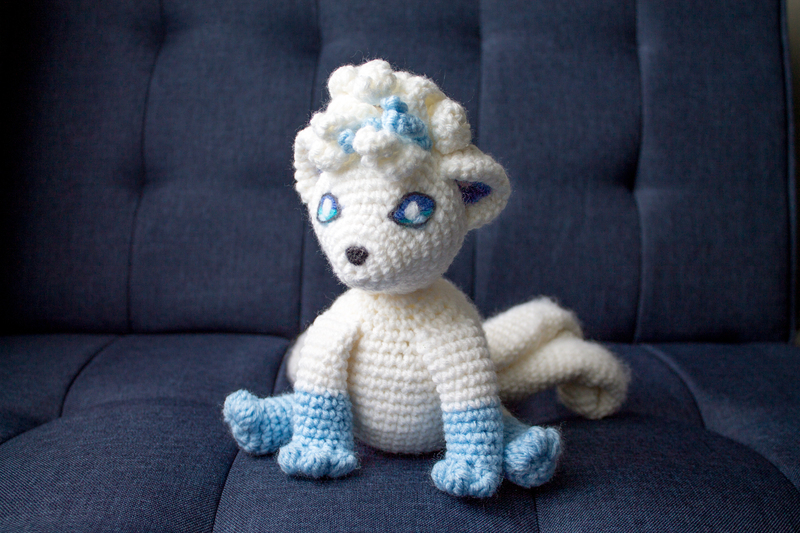 Thank you for trying this pattern – I hope you enjoy your Amigurumi Alolan Vulpix!